Staff applications for 2010-2011 are approaching for many. 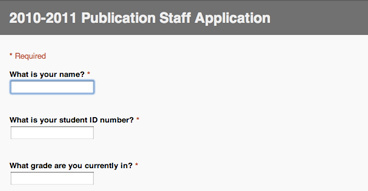 Something you might want to consider this year is creating a form online for your staff application. Using Google Documents you can create one for free – and it’s relatively simple. I’m trying something new this year, basically on what I considered a challenge from Jill Chittum. I created an online form using Google Docs for my students to apply for staff and editor positions for next year. We have to have our classes for next year set by late January so I’ve already had to start the application process. 1) I started by asking my staff Web editor for space to post applications on the student site. They gave me a page, however, I could have done this without the space. Putting a link on the student publication site just allows for a bit more exposure to the application and ease to get to it. You can see the page here. 3) From there, I basically transfered the questions from my paper application to this online form. I created a General Staff Application and an extra Editor Application for those who are wanting to interview for leadership positions on staff. 5) Take that link and either embed a link like this where actual text holds the link on the Web or use a service like http://bit.ly to shorten the link to something like this: http://bit.ly/7cxJeW. 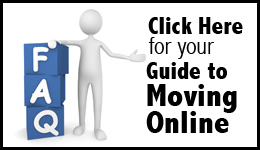 6) Promote the link wherever you can. I am still handing out a 1-page printout that explains the application process. 7) Once students hit the ‘Submit’ button at the end of the application, their answers are saved in a nice, tidy spreadsheet that only you can see. Two weeks in, I’m pretty happy with things so far. I like the fact the application is a bit more eco-friendly and I like that it’s online. Seems very 2009 to me. However, bit.ly is blocked at school so the link I promote can only be done from home unless they go to find it on FHNtoday.com. Also, the application has to be completed in one sitting. Students just can’t start filling out the form and come back to it. They either need to copy and paste all questions/answers to and from a word processing application or they just need to allot the necessary time to complete it in one sitting – which will most likely be the last night before it’s due. I’ll be anxious to see how it goes and will keep you all updated on other things I learn in the process. Anyone else doing online applications or something similar? Would love to hear.